Champignon caps with filling are considered to be a good alternative to canape. 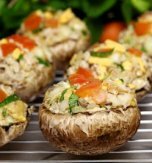 Today we are going to cook stuffed champignons with walnuts and cheese. By the way, you can stew of fry the champignon caps if you want. Place walnuts on a baking sheet covered with parchment paper. Bake the nuts at 240°C (464°F) for 5 minutes. Peel mushrooms, cut off stems. Place the stems in a blender. Peel a bulb onion and chop it coarsely. Place the onion and the dried nuts to the blender. Shred the mass slightly so it doesn’t lose all its texture. Preheat olive oil in a frying pan and put the prepared mass there. Season it with oregano and black pepper. Fry the stuffing, stirring continuously, for 5-7 minutes. Combine cream cheese and finely chopped dill in a bowl. Add the mass from the frying pan. Salt the filling and mix it thoroughly. Scoop out the champignon caps and place the mushroom heads upside down on the baking sheet. Sprinkle the inside of the caps with salt and stuff the mushrooms. Top them with breadcrumbs and sprinkle with olive oil. Place the sheet in an oven and bake the appetizer at 180°C (356°F) for 20-30 minutes. The champignons should become golden brown and become juicy. Wash rocket leaves and place them on a platter. 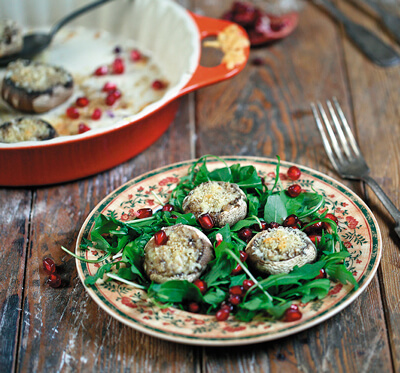 Transfer the hot mushrooms there and decorate the dish with pomegranate seeds. 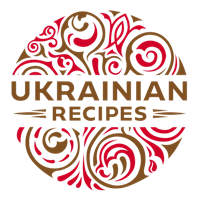 Do you have a favorite Ukrainian recipe for nut stuffed mushrooms? If so, please let us know in the comments below or write us an e-mail.